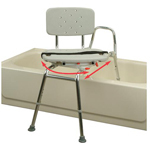 Swivel transfer bench easy to get into and out of the bathtub safely! 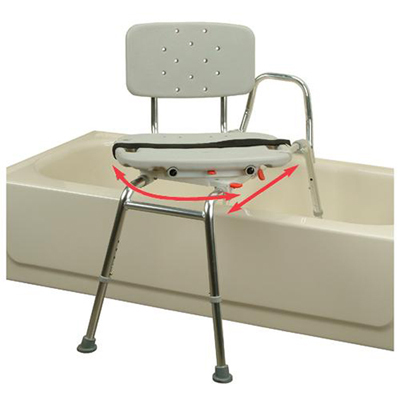 The Sliding Swiveling Bathtub Transfer Bench & Chair makes getting in and out of the bathtub much simpler for caregivers, seniors and the elderly, wheelchair users, and individuals with limited mobility! It offers users the confidence needed to feel safe bathing alone, and offers caregivers the added security assisting patients in and out of the bath. Caregivers are able to transfer patients in and out of the bathtub securely using less strain, and independent users are able to safely get in and out of the bathtub without the fear of falling. The bench supports up to 400 pounds. Seat adjustable height range from 18-3/4"" to 23-1/4""
Base width - 36-1/2"" to 37-1/4""
Place your order today for your Swiveling Sliding Transfer Bench! Some assembly required! PLEASE NOTE: This item is an over-sided item and ships via UPS only! Please choose carefully - for hygiene reasons, this item is non-returnable! 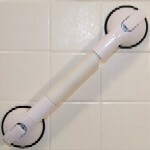 Extra strong suction grip grab bar for standard 4 inch tiles. Telescoping handle adapts to most tile configurations. Installs in minutes without tools or hardware.